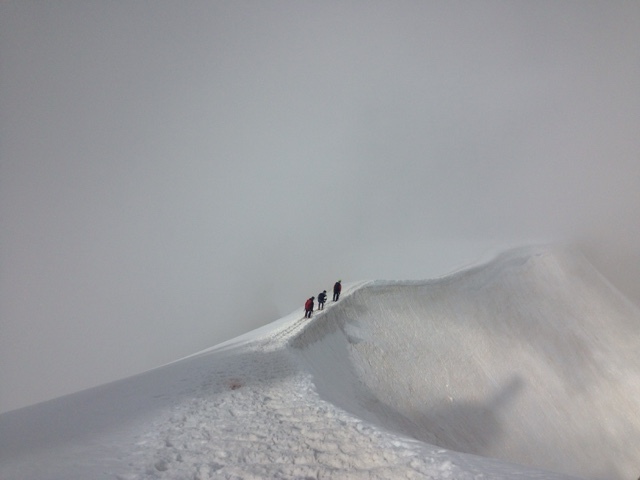 Ok, not running but I wanted to capture our day yesterday climbing Mont Blanc. An entirely new experience from throwing on shoes and running, and challenging mentally and physically in so many more ways than I imagined. 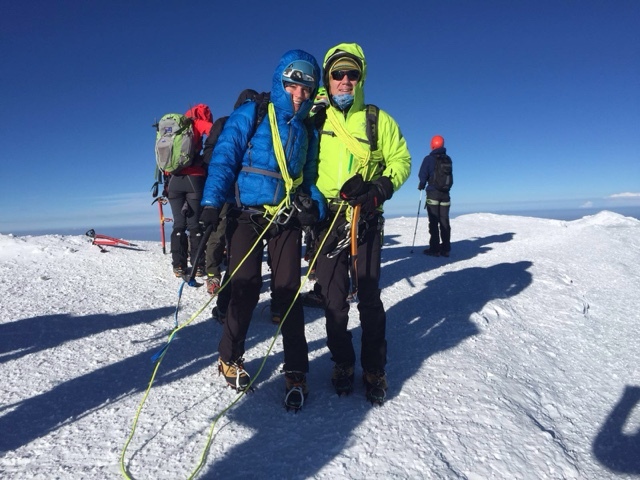 An experienced mountaineer and trained international mountain leader, this would be Giles' fourth 4,000 metre Alps peak in two weeks and 30th overall, and he'd climbed Mont Blanc a decade before. So even though I've just learnt how to use crampons, ice axes etc., I felt safe. We decided on the Three Monts route up - which would climb 1,450m to the summit at 4,809m - and to descend via the Gouter route, or the 'normal' route people take up the mountain. 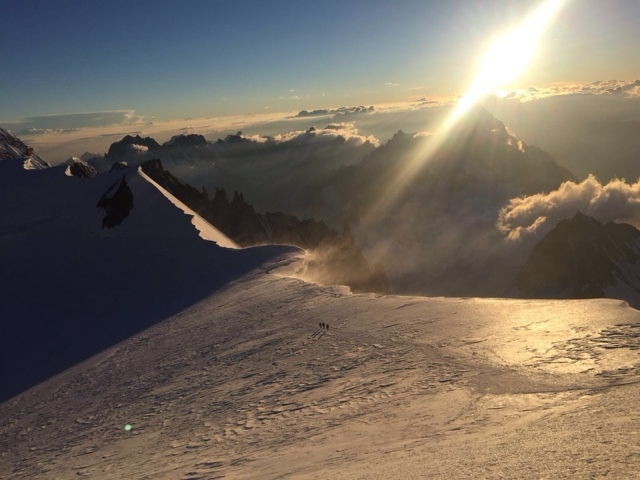 The Three Monts is more technical and some books give it a harder grade, but the huts for a Gouter ascent were full and we thought given the fine forecast it would be do-able. 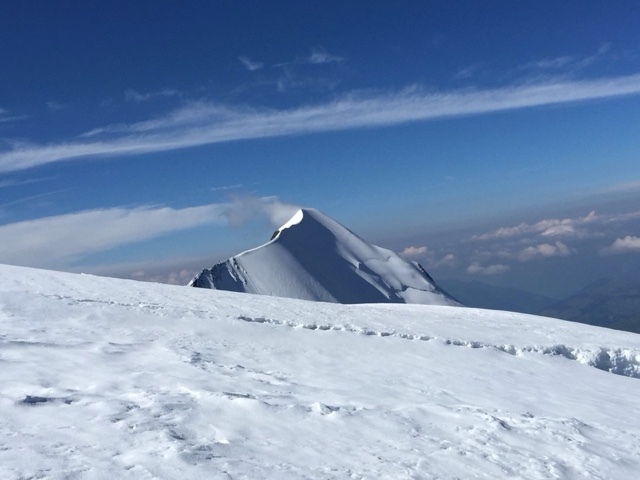 Plus passing Mont Maudit would give the opportunity for Giles to climb a 4,000 he hadn't yet (the Three Monts traverses past the summits of Mont Blanc du Tacul and Mont Maudit en route to Mont Blanc). Some thorough forecast checking in the days earlier showed Tuesday and Wednesday with clear skies, warm temps and almost wind-free at high altitude, just 10km p/h predicted for the summit, before a break and rain on Thursday. So Tuesday afternoon we caught the Aiguille du Midi telepherique, roasting in full mountain gear sardined in with hoardes of tourists from a 28 degree Chamonix. Heading out of the viewing station at the top through the ice tunnel and onto the east ridge of the Midi was sobering. A steep descent onto a ridge just a few feet wide with super steep drops hundreds of metres either side, and slushy late-afternoon conditions made for tentative progress down to the Col du Midi where we made our way to the Cosmiques hut for the night - just in time before snow clouds descended on the mountain for a few hours. 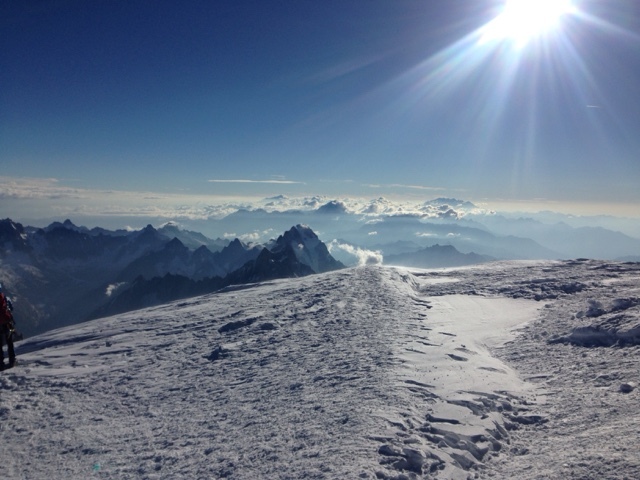 The view across the Mont Blanc massif was incredible. The Bossons glacier sprawling in front of us, the Aiguilles du Midi, Chamonix a few km below and most relevant, the steep slopes of Mont Blanc du Tacul illustrating what the first section of the climb would entail. Quite honestly, I couldn't imagine climbing this - it looked so steep and fraught with crevasses. For an hour and a half as we ate dinner with a hundred gnarly-looking mountaineers (I did not feel one of them!) I watched two parties of climbers descend Tacul; slow, exhausted steps down the serac-laden route trying to reach the refuge before night fall. I was both fearful and excited for the unknown and what lay ahead. What better way for Giles to fully enjoy his birthday than get up at 12.40am for breakfast and climb a mountain! 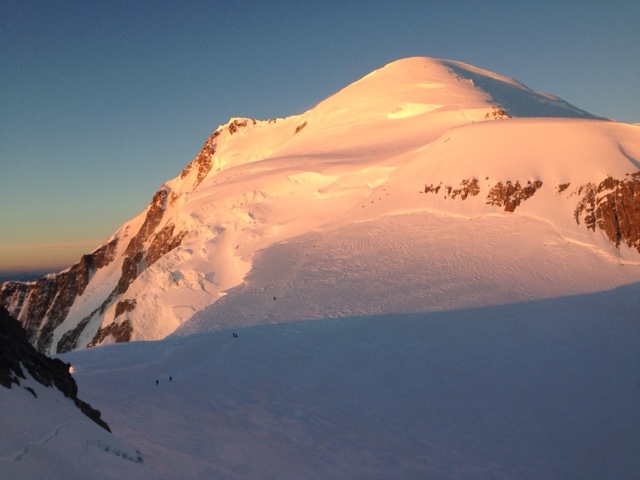 Most climbers start at 1.30am - 2am, aiming to summit by 9am and safely descend before snow melt causes more risks of rock fall. Neither of us had slept in the crammed, snore-fest of a bunk room, but I felt fine considering - full of adrenaline - and we forced down some muesli and tea before gearing up and heading out into the snow to join a long line of headtorches up to the Tacul ascent. There were some pretty steep, calf-burning sections as well as more sustainable zig-zag lines, but on the whole it wasn't as challenging to hike up than it had looked from the hut window. When you're right there on it, you don't see the crevassed terrain in the same perspective, and the crevasse crossings had wide bridges and felt safe. 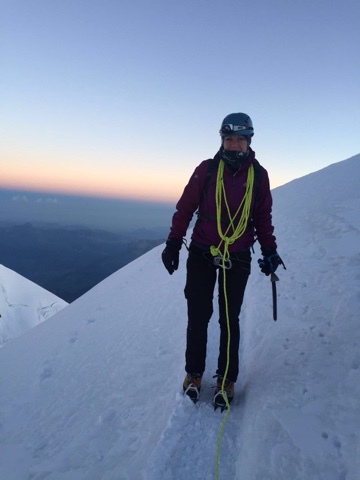 It felt tough but the kind of tough that also feels amazing - how could it not when you're surrounded by the beauty of the Mont Blanc massif shrouded in moonlight, and Chamonix glistening 3 km's below us. Overtaking other groups was at times challenging - at least 200 people would try to summit today - but we had to be patient and I had to remind myself constantly that a sustainable pace was all that was needed, we were not racing anyone. We reached the top - the shoulder of Mont Tacul - in just less than two hours, ahead of schedule, and had a brief respite of slight downhill to Col Maudit before another steep climb up to the second Col du Mont Maudit (yes, confusing), stopping en route to insert hand warmers into gloves and don buffs to protect our faces. It started with the zig-zags criss crossing across the crevassed glacier but after another hour we reached a queue of climbers. Here was an imposing wall of icy snow and teams were lining up to clip onto a fixed line, with some taking out two ice axes for safety. Our hands and feet were getting cold hanging around at the base, but we had to wait for people to make their way up. As our turn came, we clipped in and started the climb steadily. I was as safe as I could be, attached to the line, roped to Giles and an ice axe, but I tangibly felt the open space behind me as I edged up. Giles waited ahead at a rocky outcrop and as I climbed I realised with panic that not one but both crampons were coming loose. We thought we'd been careful to work out the bindings but I'd hired warmer high altitude boots and combined with the steep climbing this must have affected the fitting. Imagining my crampons tumbling 1000 feet below I was even more careful with my footing and securing the axe in place before moving, and reaching the outcrop we refixed them for the final pitch ahead. Giles moved to reach the top of the col and belay me up, but our progress was hampered by another party and their guide climbing over our rope and racing to the top. At the top we were very cold and I was shaking with the adrenaline of the ice climb. Ahead lay a narrow and icy ridge path just a foot wide, above snow cliffs dropping off to the right; it was a dramatic, exhilarating hike leading up to the next col, Col de la Brenva. Around us the sky was now lightening and the shadowy mountain skyline waking up with a dusky pink alpenglow. I'd thought we'd take in some tea and refuel here but we couldn't even face stopping to put on our down jackets, with windchill the temp must have been -15 to -20 and we were quickly realising the wind was much stronger than forecast, whipping and whistling fiercely across the col. We headed forwards as swiftly as altitude would allow to try and escape it on the next climb to Mur de la Cote, the penultimate ascent before the final summit ascent. But there was barely a respite on the climb, one switchback we'd be head first into blasting bitter wind and the return would be a steeper gradient - tough ground for tired legs and gasping lungs. I knew Giles was cold and we needed to get our down on and get some fuel in so when we spotted a rock with other climbers crouching behind we took our chance and stopped there for 5 minutes. A quick layering up, some warm hut tea and a few bites of spinach tart and back we went into the wind. By this point we could clearly see the summit, smooth yet steeply rounded and shrouded in alpenglow, but we had a further 325 metres of hard climbing to reach it. Switchback by switchback with hardly a word said. At this point I was just trying to keep a sustainable rhythm, and attempting to work out the best way to keep my face covered yet still be able to breathe as deeply as I needed to - a tricky balance! It was almost impossible to appreciate the scenery around us whilst ascending in the wind but as we approached the summit I couldn't stop the lump in my throat and pure relief that we'd made it in the time we needed to. 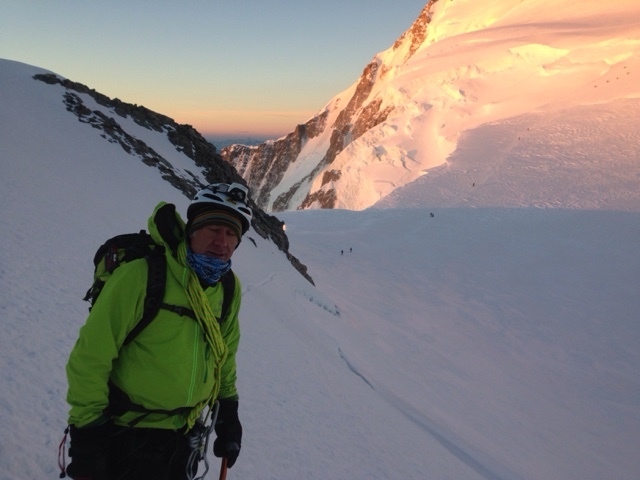 It was 8.20am - the climb had taken us 6 hours 20 minutes from the hut. If we kept strong we could descend in 5 hours via Gouter and make one of the late afternoon trams back to the valley. Standing on the highest point in Western Europe was surreal, with coloured cloud banks and mountains stretching all around and below. 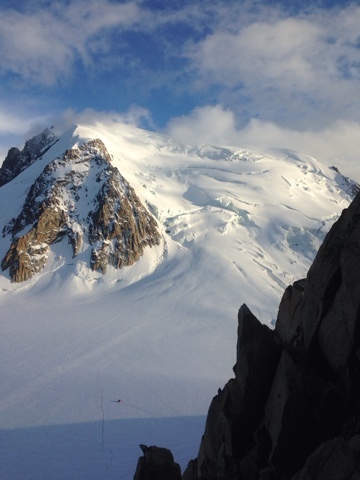 A couple were sitting down on one of the south slopes out of the worst of the wind so we followed suit and had a quick break before taking off for the descent to Gouter, first towards the west via the Bosses ridge. 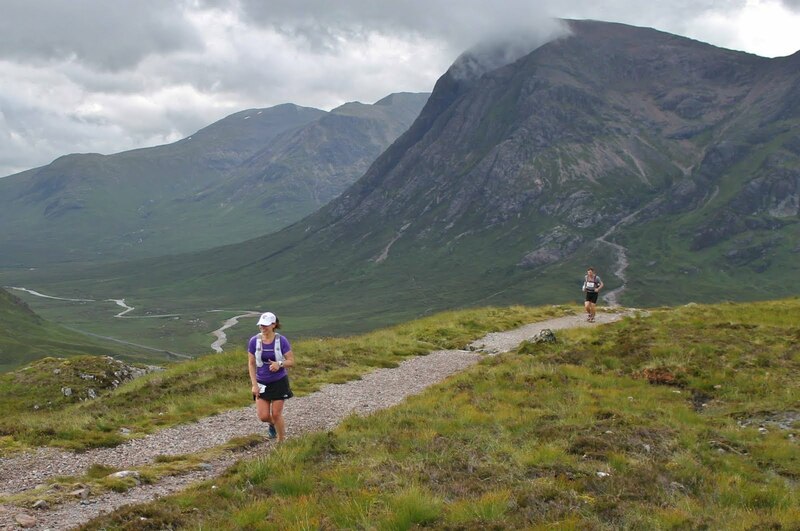 Another dramatic, beautiful ridge winding for hundreds of metres ahead, similar to the Midi east ridge. We dropped down over the Petite Bosse then the Grand Bosse crossing into the Italian side of the ridge, exposed but easy ground. I'd naively thought that the 'normal' route wouldn't have many or any technical sections but we soon found ourselves in yet another queue of people at a tricky set of snow steps above a gaping hole into a crevasse. We were growing colder as we waited in the bitterly wind and I can see why queues like this can make for dangerous climbing - and as well as the cold there's pressure to down climb the section fast to let others through. Giles roped me down and I clung to a step above the crevasse, with a narrow snow bridge to jump down to over the crevasse, one of those situations where the longer you think about it the harder it becomes. A few minutes later I was down and the guides behind us had it mastered in seconds by facing forwards and jumping without the axe - but I don't think this strategy would have ended well for clumsy me! 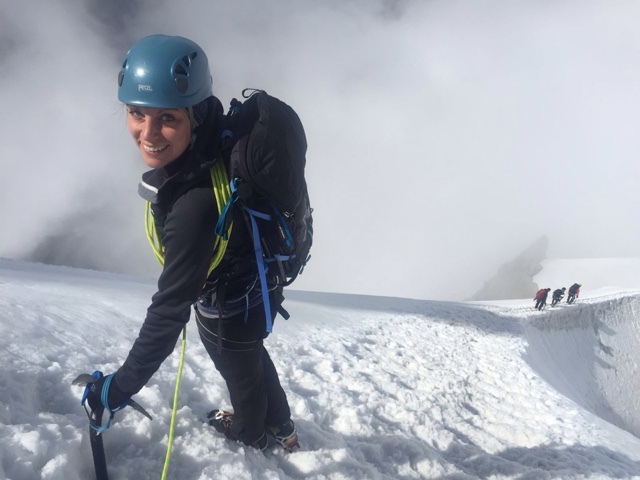 Safely through and with shaky legs, we were back on firmer ground, a steady ridge past the Vallot emergency shelter across to the Col du Dome, before traversing around the Dome du Gouter. At 10.30am we reached the Gouter refuge, an impressive, space-age building set into the rockface of the Aiguile du Gouter. A little spaced out ourselves, we refuelled on a 10 Euro slice of quiche (French huts aint too cheap these days), coffee and hot chocolate. We couldn't let ourselves rest too long - we still had around 3 hours of descending on tired quads and sleep deprived brains. 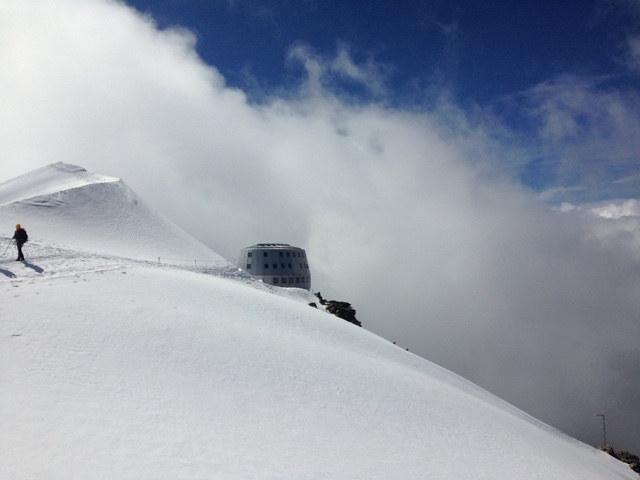 Gouter refuge: great coffee and quiche but you pay for it! Next came a technical, via ferrata-style descent down the rocky ridge next to the Grand Couloir. There was no snow to be seen so we packed the crampons, ropes and axes away and used the fixed support lines down the rocks. This drop of 600 metres took around an hour and a half, with the distinctive echoes of rocks trickling down the couloir reminding us on several occasions of the danger of the section below us. We'd have to cross directly through the bottom of this couloir - one of the infamous sections of Mont Blanc where over 70 people have lost their lives through rock fall or avalanche over the past two decades. 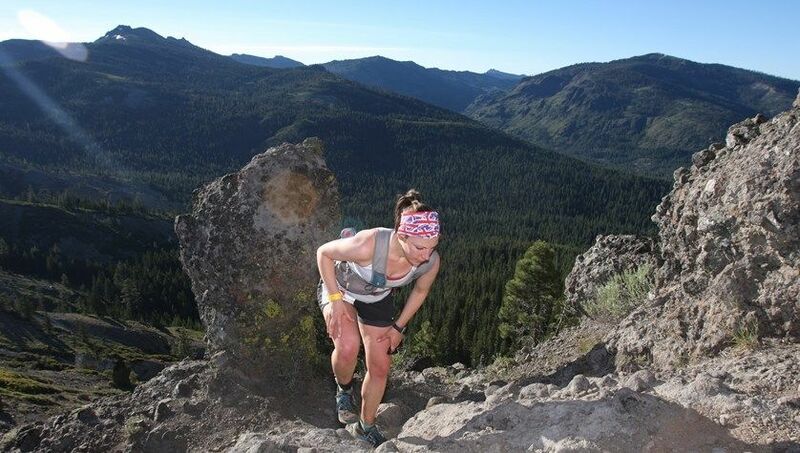 There is almost constant rock fall here through the summer months, and especially in the afternoons, when snow melt higher up in the gully unsettles loose rocks which set off chain reactions down the long, steep face. At the bottom we waited for other groups to clear the crossing before studying the ground above for movement and listening for rocks. One by one we crossed, half running, half hiking. It takes a matter of minutes to reach safer ground and we celebrated by breaking out the walking poles and sliding over a snowy field - the last of the day - to pass the Tete Rousse hut (another point people start the climb from) and another rocky but more hikable hour of descent to the tiny Rognes refuge. We were trying to find the Nid D'Aigle station - the highest stop for the small train from St. Gervais - and thought the Rognes refuge was it, but something was telling me the descent wouldn't end this easily and sure enough some walkers told us the station was yet another hour down rocky terrain. We found some energy and hiked down in under 40 minutes to sneakily catch the 3.20 train as it was edging into the platform. Those poor tourists who found themselves next to us, dehydrated, depleted and seriously stinky from 11 hours of hard work. I felt battered and shattered last night but a new person today - grateful for ten hours of sleep, being back in the valley and deserving of some real R&R before the CCC. Taper time indeed. you are incredibly brave!! I would love to have a go as an alpinist having watched them last year from the cable car. Having got to the end of this, out of breathe and relieved on your behalf, you then remind us you have the small matter of the CCC to do!! That's such beautiful light on the summit! Well done, it sounds like an ultra in its own right. It was; just beautiful and made the struggle worth it. 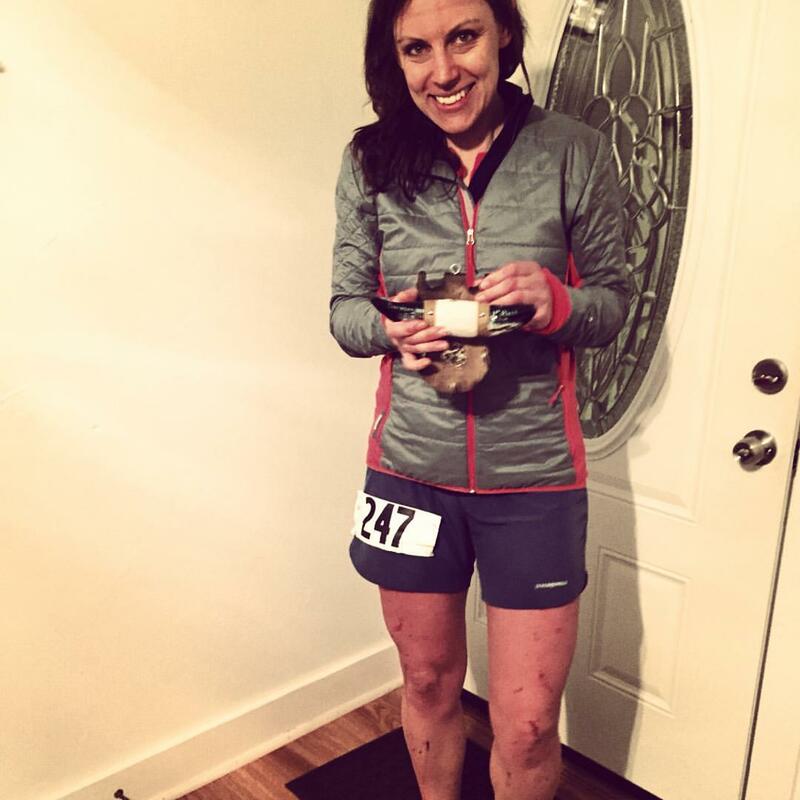 Hope you're doing well and recovered from the Long Trail, so tough! !